The Wizard of Oz is an iconic movie, beloved by old and young alike. Every moment is so well-known that it is ingrained in our culture, from "I'll get you my pretty, and your little dog too" to "There's no place like home." It's almost impossible to imagine it any other way, so when I heard that there was a new Andrew Lloyd Webber stage adaptation (being not the biggest ALW fan), I was a little skeptical. But I was also curious, so I eagerly, although somewhat trepidatiously, attended Blogger Night at the Ordway last night. And I'm happy to report that a few minutes into the first scene I was completely won over. I found the show to be a clever adaptation with innovative use of video technology and some great new songs that add to the story, along with the familiar tunes we all know and love so well. It's such a thrill to hear those familiar songs played by a live orchestra, with the beloved characters coming to life before our eyes. The Wizard of Oz is definitely a family affair (I saw more than one little girl dressed like Dorothy), but it sure to be enjoyable for anyone who loves the movie (and really, who doesn't?). Danielle Wade couldn't be more perfect as Dorothy. Her voice is a powerful instrument and she exhibits incredible control over it; her "Over the Rainbow" is a thing of beauty. She also possesses the charm and likeability necessary in the beloved heroine. Dorothy's three Oz friends are perfectly delightful, from Jamie McKnight as the adorably scattered Scarecrow, to Mike Jackson as the tender tin man with the beautiful baritone, to Lee MacDougall as the tough but cowardly lion (who's a proud friend of Dorothy!). And they also exhibit their specific characteristics while in Kansas mode, which is fun to observe. The witches are wonderful and manage to differentiate themselves from both the movie and that other Oz musical adaptation (e.g., instead of pointy hats, they have pointy hair). Robin Evan Willis makes a lovely Glinda and Jacquelyn Piro Donovan is deliciously evil as the Wicked Witch (with one green leg sticking out from her dress ala Angelina Jolie). The opening number, a new song called "Nobody Understands Me," is a great song, a little more earthy and rustic than the Oz fantasy songs (this is Kansas, after all) and sets the stage well. Professor Marvel gets a new song, as does the Wizard and the Wicked Witch. I found the closing number "Almost Home" to be a little cheesy, but all-in-all I thought there was just the right amount of new songs and they all served a purpose. The effective but not too elaborate sets use perspective and colors painted on two-dimensional pieces to create the various worlds of the play. 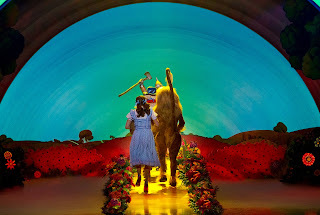 The special effects, including the tornado and flying monkeys, are created with the use of video projections on both the backdrop and scrim, with lights shone both on stage and into the audience for dramatic effect. It's extremely clever and well-done. Don't get me wrong, I don't want to start seeing videos every time I go to the theater, but in this production, it works (sets designed by Jeremy Sams, video by Jon Driscoll, and lighting by Hugh Vanstone). The munchkins are completely adorable. Actors of normal height (or maybe a little on the short side) stand in such a way (slightly bent at knee and waist) that they appear to be smaller without looking awkward. Kudos to the ensemble that plays everything from munchkins to soldiers to ozians. And they're pretty fantastic dancers too in some great big dance numbers. The choreography (by Arlene Phillips) is fresh and new, but also familiar. 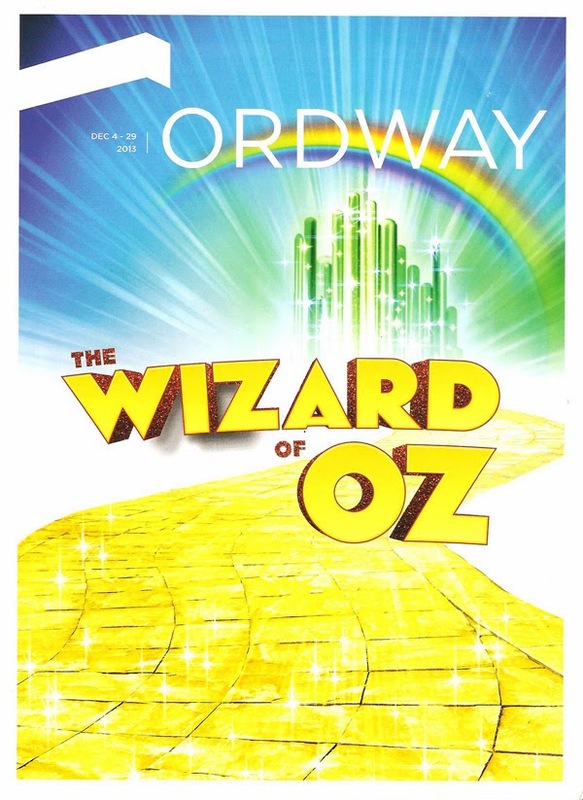 The costumes are beautiful, from the blue-toned and playful munchkin costumes, to the sleek green dresses and suits of the ozians, to the familiar looks of Dorothy and friends. Last but not least, little Toto is played by a real dog, a consummate professional who hits every mark and does everything he (or she?) is supposed to. 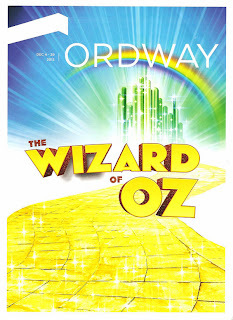 Andrew Lloyd Webber's The Wizard of Oz is playing now through December 29. This production is the movie come to life, with new bits that add to the story and make it even more wonderful.